This revised and expanded fourth edition is packed with new material that covers all the latest features of Ubuntu 10.04, Lucid Lynx. It includes five new chapters that take you step-by-step through common tasks like installing and playing games, accessing your favorite social networks, troubleshooting common hardware and software problems, connecting with the Ubuntu community, interacting with your Windows installation, and more. If you're looking for a pain-free way to learn Linux, Ubuntu for Non-Geeks is just what you need to get started. 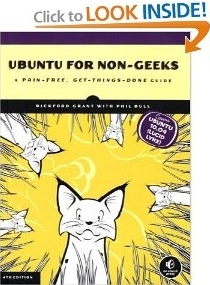 S. Keeth of Dallas, TX says, "I have read 3 books recently on Ubuntu Linux, and this was easily the best of the bunch. It is well-written and well-edited (some computer books, when first released, have an unacceptable number of errors in them). If you are new to Ubuntu, or even new to Linux, this book is a great introduction to Ubuntu Linux. However, it goes beyond that. When you finish the book, you will have a lot of knowledge about Ubuntu, and you will be much more comfortable with this excellent operating system. "It also suggests additional resources from which you can get more info if you want or need it. Of course, no book of this kind can be all things to all people. Power users, programmers, and those who want to learn all about the innards of Ubuntu will need more advanced books and⁄or instruction. "The chapter progression makes sense, and the authors do a good job of showing you how Ubuntu can be a more than adequate, and in many ways better, replacement for Windows. The authors also introduce you to the software that comes with Ubuntu, as well as the wealth of additional software, mostly free, that is available for installation in Ubuntu, a lot of which provides free alternatives to the Windows software that can cost hundreds or thousands of dollars, depending on your needs and wants. The book walks you through some procedures that will help you get hands-on experience.